What are the Node addresses? What exactly am I folding? So you’re on-board, you’re folding, and you’re excited to help – but you simply must know, what ARE you folding? What are the technical processes going on back there, and how does the science get done? Dan Ensign has written a great piece called “Runs, Clones and Gens” on the [email protected] Wiki that gives great detail about how work is generated. This is the full ledger of pre-mined coins, including transaction IDs (txid) and addresses. This accounts for funds controlled and released by CureCoin. 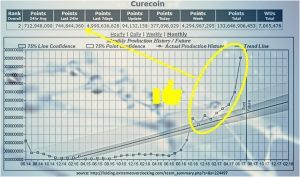 What is Proof of Stake in CureCoin? CureCoin’s Proof of Stake mintage begins in 30 days, and maxes out in 90. While your stake is higher the closer you get to 90, you may find better returns by regularly minting closer to 30 days. The CureCoin wallet takes care of this whole process for you. It must be unlocked and open in order to Mint. Here, enter ‘walletpassphrase <your password> 99999999 true’ and hit enter*. After a few moments, your wallet will be ready to mint. The above unlocking procedure only applies to Encrypted Wallets. An unencrypted wallet will mint, but is unsecure. Its recommended that you ALWAYS encrypt your wallet. As a optional precautionary measure, clear the console window and then close it (press CTRL + L to clear the text in the console ). Proof of Stake is a method of securing the CureCoin network that works alongside the Proof of Work portion. Proof of Stake is based on the number of coins had, and how long they’ve been held. In this way, it works to prevent the well-known 51% attack – an attack wherein the perpetrator overtakes 51%+ of the Proof of Work (mining) network. In order to do this to a Proof of Stake coin, an attacker would need to hold 51% of the entire supply of CureCoin, and any attack performed would hurt their own share. If any part would come to hold 51% of the currency, they’re likely to hold a strong interest in keeping the coin alive and well. All coins in the Peercoin network collect coin age. Your stake is calculated from this coin age, measured by last transaction, and multiplied with the amount of coins (time * coins). Transferred coins lose their age and start a new “life” as fresh coins. When you keep coins for 30 days, they are old enough to start the minting process. From that moment on the software tests the “search space” given by the coin age, the limited options are tested if they “solve the puzzle” like in Bitcoin mining. You can simply think of this by comparing it with a raffle. But it is a raffle that lets you keep the tickets every time you do not win a round. And with it the chance of producing a valid solution of the next puzzle increases. More coins equal more raffle tickets. So 100 coins at an age of 30 days are twice as likely to solve the “puzzle” as 50 coins with 30 age days. The maximum age a coin can have is 90 days, after this the coin does not age further. When a puzzle is solved you can mint 1% of your input, by sending 101% of the coin to yourself. With it you “consume” your built-up coin age. As you test against a limited number of raffle tickets (the “limited search space”), this requires significantly less power. Attacks become more difficult as well, instead of controlling 51% calculating power to take over the block chain, you need 51% of the coins that are put up as stake! When a block is minted, your new coins will be unspendable for a period of 520 blocks (~ 3.6 days with 10 minutes blocks). More information can be found in the Peercoin whitepaper. *99999999 is the time, in seconds, to remain unlocked. You may choose to unlock for shorter periods, if you like, but run the chance of re-locking before mintage is complete. Where can I get details on Pre-mined Coins and Future Mintage? Can I dump slow work units to increase my PPD? Dumping Work Units is hurtful to the [email protected] project. Orphaned work is “lost” until the units time out and re-enter a work queue. This slows down the overall progress of the Folding project. Work Units are assigned according to the “luck of the draw.” Some will be a bit faster, some a bit slower. The Stanford Team tries to balance the speed of units with the points rewarded to keep things fair and worthwhile, and in the end it all balances out. Attempting to shortcut your way to faster/more valuable work will NOT work, short or long term. Please, just accept the Work Units you are assigned and only drop units if there is a technical reason (hardware malfunctions, hung units, etc). Remember that an integral part of CureCoin is to help [email protected] complete valuable research. Be a conscientious folder. View the [email protected] Best Practices. Folders must maintain an 80% submission ratio to earn Bonus Points! Dumping Work Units will prevent you from earning the expected PPD.